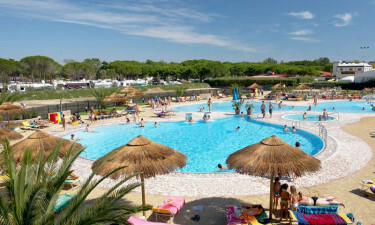 Situated on the stunning Adriatic Coast of Italy, Villaggio Turisico Internazionale has been created to appeal to lovers of luxury camping. 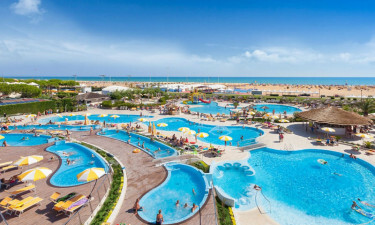 While the main attraction here is the stunning, sandy beach, people who book a holiday in a state of the art mobile home here will also be able to take part in a wide range of activities right on the site itself, and entertainment options are provided for the whole family to enjoy. Do you really want to be spoiled? Then you can book half board extra (breakfast and dinner) for € 28 pppd, children (6-12 years) get 50% discount, children up to 5 years eat for free. As if you are staying in a hotel! You can also book this on the spot. 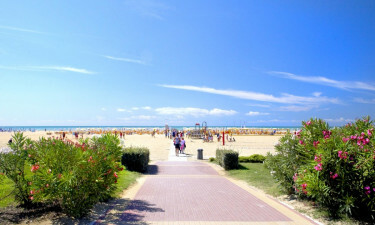 Why go for a camping holiday at Villaggio Turisico Internazionale? A modern spa can be found in the heart of this luxury camping site and this is the perfect place to indulge in a little pampering. Bibione Thermae is open all year round and offers an excellent selection of spa treatments that are sure to leave guests feeling on top form from head to toe, while the complex is equipped with a steam bath, sauna and solarium. People who like to be active will have the chance to take part in a wide range of sports activities while they stay in this impressive LUX-Camp. People who want to try their hand at archery will have the opportunity to tackle this exciting activity under the supervision of experienced members of staff, while there are many other activities here that are just waiting to be tried. The luxury camping site is situated close to a number of exciting attractions that are waiting to be explored. Excursions are organised and run by the campsite staff, who go out of their way to make sure that guests are fully entertained during their day trips. Some of the destinations that are available to choose from include the stunning city of Venice, and the dramatic 16th century cities of Treviso and Trieste, which boasts attractions such as the Giant cave and the world famous castle of Miramare. Guests are treated to a wide range of dining options that are sure to tickle their tastebuds. 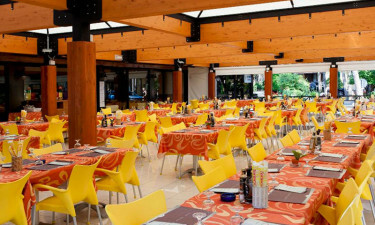 Lovers of freshly caught and prepared seafood dishes will find plenty to tempt them at the Ristorante al Mare that overlooks the ocean, while the Ristorante al Villaggio serves up an excellent assortment of Mediterranean dishes. 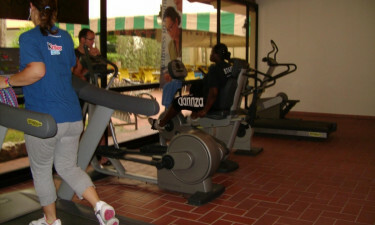 International breakfasts and light bites are also offered at the Internet Cafe, while the Pool Bar can be found near the onsite water park and provides a good range of sweet and savoury treats, as well as cool cocktails. Whether you are searching for groceries to use to create meals for the family in your mobile home, souvenirs or beach items and toiletries, the modern onsite shopping centre has all of your shopping needs covered. There is a good range of items available to choose from at very reasonable prices and staff are always available to provide assistance if required.